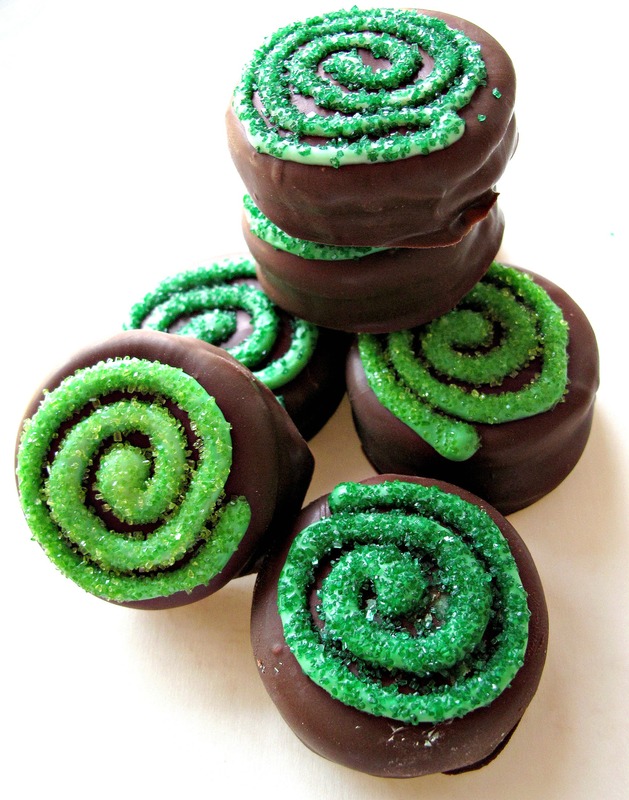 St. Patrick’s Day Chocolate Covered Oreos have been sent off in Military Care Package #10. I hope the “luck of the Irish” will help keep Soldier B. and his comrades safe as they serve and bring them all safely home soon. Soldier B. is very busy doing his job, so I really don’t expect to hear from him much, but I worry. So, I was delighted to get a Facebook message from him letting me know that the care packages are appreciated. Most importantly, the message let me know he was safe. 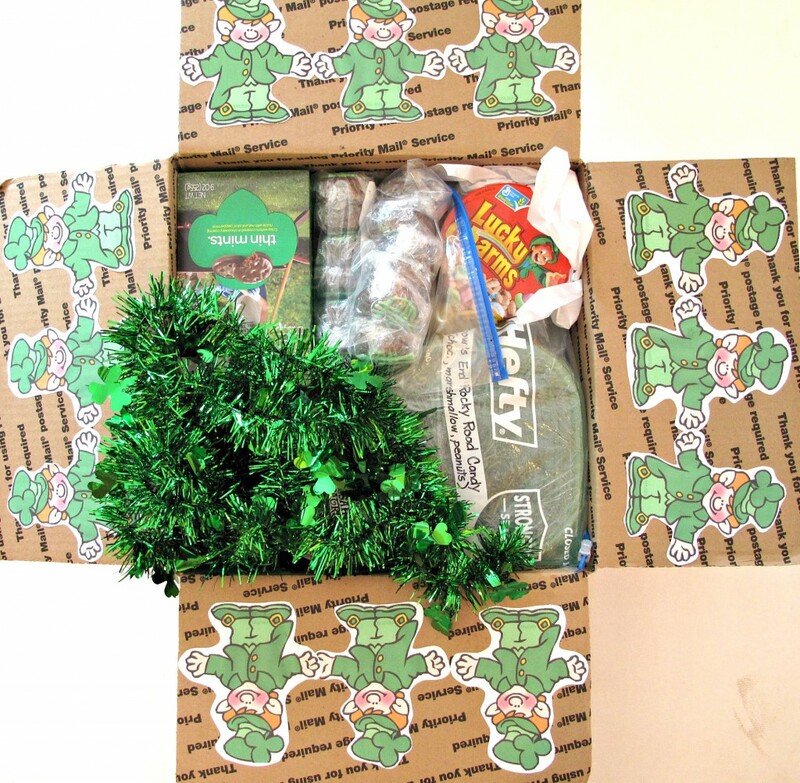 Part 1 Care Package Contents: With smile-inducing packaging in mind, my first task, when preparing a care package is to dress up the inside of the shipping box. For some themes like Christmas or birthdays, the easiest method is to line the box, or cover the box flaps, with theme appropriate wrapping paper. For Easter and St. Patrick’s Day last year, I cut holiday shapes from colored or patterned paper and glued those onto the box flaps. I used newspaper photos for the baseball theme. Free online clip art is another source of decorating material. I found clip art turkeys for Thanksgiving and used wee clip art leprechauns for this St. Patrick’s Day package. 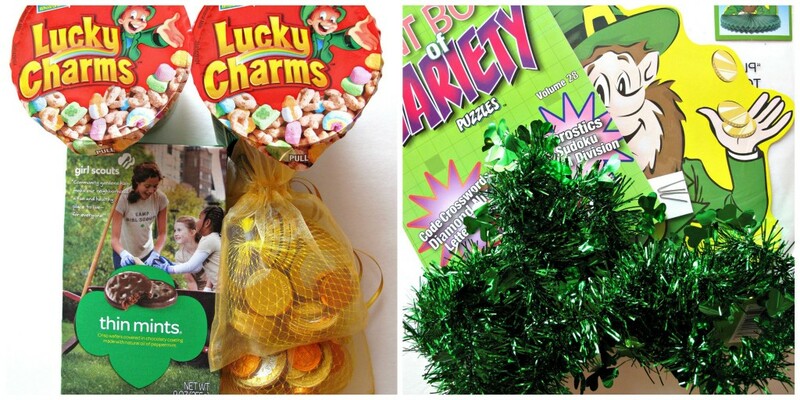 The box is packed full of leprechaun goodies: shamrock garland, leprechaun cut-outs, Lucky Charms cereal, gold foil chocolate coins, puzzle books with green covers, and a green box of Girl Scout Thin Mints. Part 2 Decorated Cookies: Usually this section provides details on a simple iced sugar cookie design. Easy-to-create iced shamrock cookies were included in last year’s St. Patrick’s Day military care package. 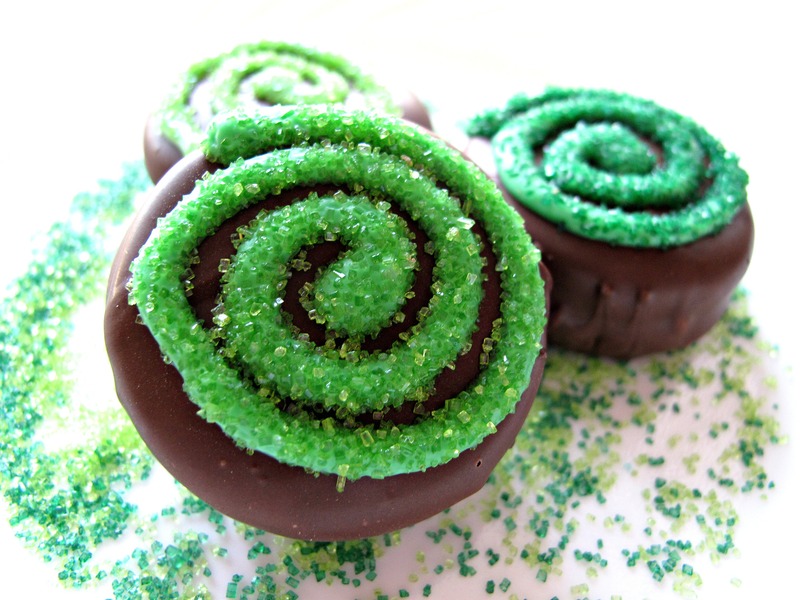 This time I decided to chocolate coat, then decorate, some St. Patrick’s Day Chocolate Covered Oreos using colored white chocolate. Soldier B. is particularly fond of chocolate-mint and I had what I thought were great ideas for decorating. I appear to be gaining all kinds of decorating experience through the school of hard knocks. It turns out that decorating with melted white chocolate doesn’t work the same way as decorating with icing. It solidifies too quickly. I tried making shamrocks and ended up with a blob of green tinted white chocolate covered in toothpick lines. Not what I had in mind. 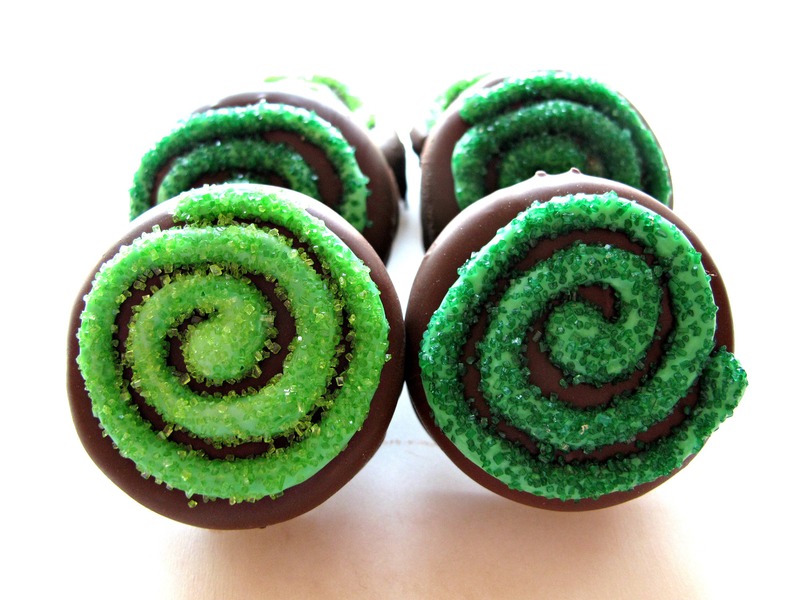 I tried using a Wilton candy melts tip to create a green plaid and ended up with a messy zigzag of lines. At least my family was happy about these failures, because they get to eat all ugly cookies. And these were ugly. Finally, out of desperation, I went for super simple. The Celtic Spiral is an ancient symbol of the Celts who inhabited Ireland starting around 500BCE. It is said to be a symbol of energy, growth, perseverance and knowledge (http://www.the-symbols.net/celtic/) Seems like a good symbol to use on cookies for soldiers, or anyone else! Though this sparkly swirl is not what I planned, it is appropriately green, Irish, and twinkles with leprechaun magic. 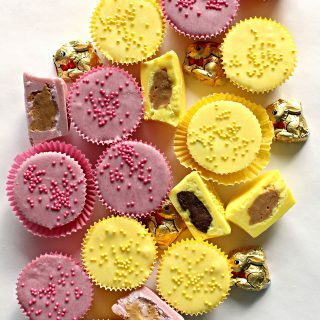 Change the color of the tinted white chocolate and decorator sugar, and these chocolate coated Oreos would work for any celebration. 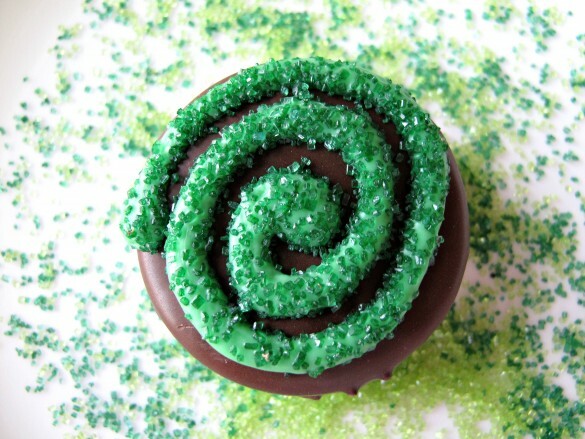 No recipe is needed for making St. Patrick’s Day Chocolate Covered Oreos. I offer some directions that are intended as helpful hints. I used Chocoley.com Candy and Molding formula for coating the Oreos, because it’s easy to use (no tempering), tastes delicious, and stays looking pretty for weeks. Once the coating is set, I piped on the spiral using tinted Chocoley.com Drizzle and Design white chocolate, followed immediately with a sprinkle of green decorating sugar. Keep It Simple wins again. 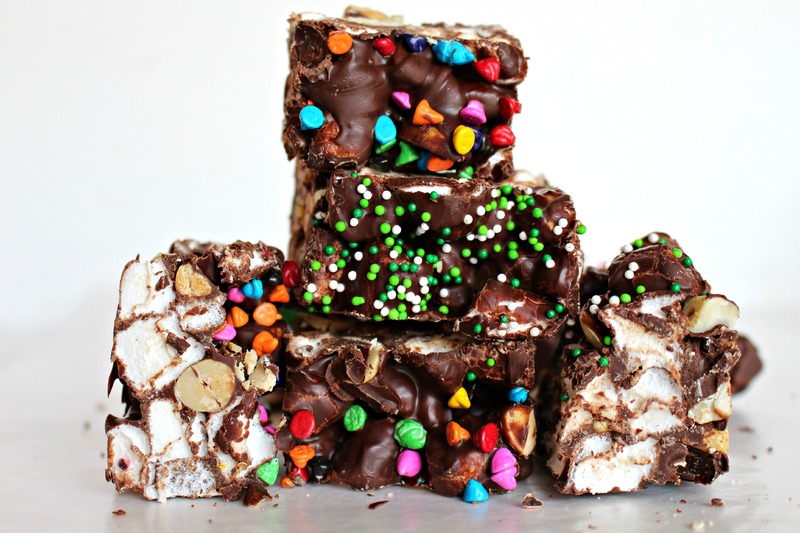 Part 3 New Recipe: Rainbow’s End Rocky Road Candy was the new recipe included in this care package. 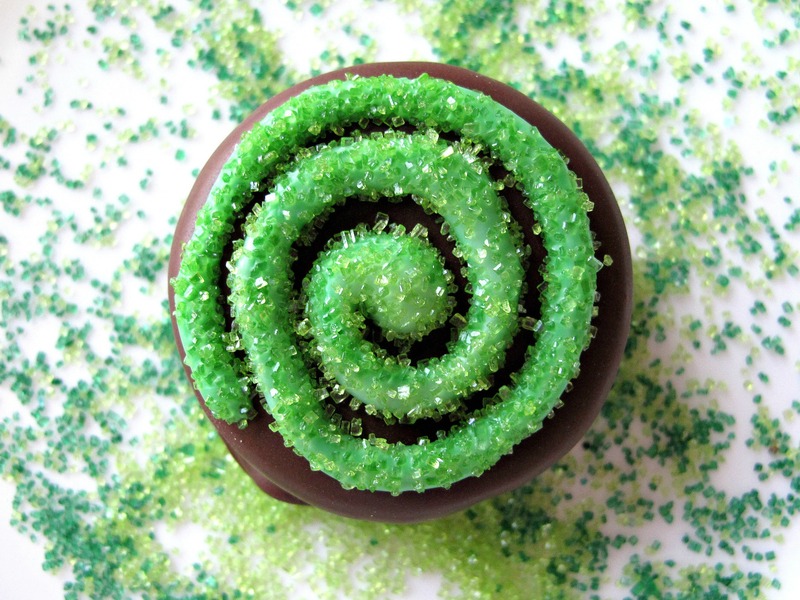 I turned this chocolate, marshmallow, and peanut confection into a St. Patrick’s Day treat with a sprinkle of rainbow chips and some green nonpareils. The Rocky Road was packed in plastic food storage boxes. I am pretty sure the weather is cool enough right now in Afghanistan for this candy to arrive intact, but just in case it melts, the plastic boxes will serve as soup bowls and Soldier B. can eat it with a spoon! 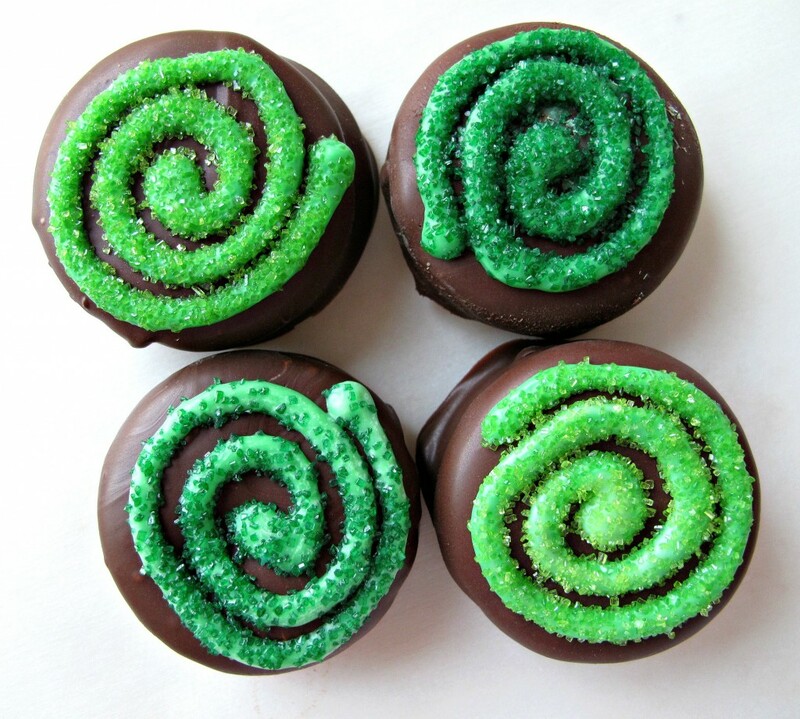 Add some ancient Celtic symbols to your St. Patrick’s Day celebration, preferably on top of St. Patrick’s Day Chocolate Covered Oreos! Use wax paper to line a cookie sheets or other flat baking pan that will fit into your refrigerator. Place the melting chocolate in a bowl large enough that the chocolate fills it up to 1 inch below the rim. Melt the chocolate wafers in the microwave at 50% power for one minute. Stir. If not completely melted, return to the microwave and heat for 15 second intervals, stirring between intervals, until melted. Place a cookie into the melted chocolate. 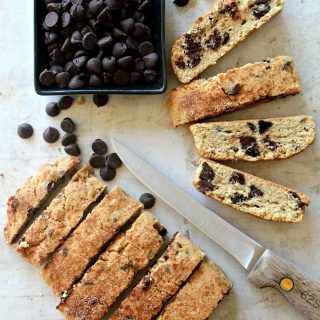 Using two forks, press the cookie into the chocolate, then turn it over to coat the underside. Using a fork, lift the coated cookie over the bowl. Gently tap the wrist of the hand holding the fork to make excess coating drip back into the bowl. Place the cookie onto the prepared cookie sheet. After coating 12 cookies, place the cookie sheet into the refrigerator for 10-15 minutes to set the chocolate. Setting in the refrigerator, not at room temperature, will produce slight surface shine. Place ½ cup of white melting chocolate a small bowl. Melt at 50% power in the microwave for 30 seconds. Stir. If not completely melted, return to the microwave at 50% power for 10 second intervals, stirring between intervals until melted. Add 10 drops of oil based green candy coloring. Stir until the white chocolate is evenly colored. Spoon the melted chocolate into a plastic sandwich/snack bag. 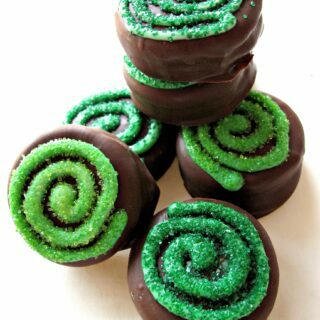 Cut a very tiny piece off a bottom corner of each bag and pipe the colored chocolate in a spiral pattern to Important: Add decorating sugar immediately after creating each swirl. The chocolate hardens quickly. When all of the coating and decoration has hardened, wrap the cookies individually in plastic wrap. Store in an airtight container at room temperature for up to 2 weeks. 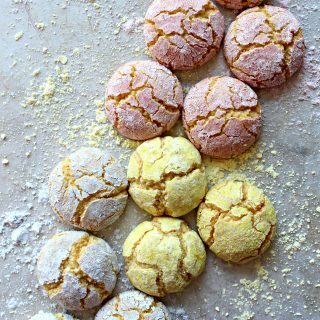 Pack the individually wrapped cookies closely in a ziplock bag or plastic storage container. If using a storage container, add crumpled tissue paper between the cookies and the lid, if necessary, to prevent ANY movement while shipping. I LOVE your new look Wendy! So cute and bright and inviting! This care package is cute too! You put such thought and care into each one. It must of been great to hear from him on Facebook. I think he’ll really enjoy this one. Thanks, Reeni! I appreciate you noticing! I love the new look too, but I will love it even more once the glitches have been worked out! 🙂 Sending the military care packages is an honor, my tiny way of showing thanks. Hearing from Soldier B. is a relief and a joy. I have no idea how military families emotionally survive deployment! I bet they cannot wait to get mail from you!! These look fantastic. I love the new look of the site Wendy! So nice and fresh and clean! What a great looking care package as always! I had such a huge weakness for chocolate covered oreos when I was a kid – I can’t buy or make them now because I go through them too fast! The site looks great, Wendy! I can’t wrap my head around all the technicalities of the blog so I applaud you for all the improvements. I love your care packages and how you tailor them to the various holidays. How much more fun can it get and what a treat and tasty diversion for the soldiers. 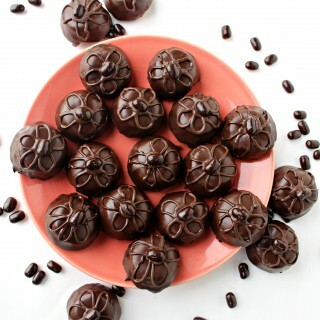 Who would not love chocolate covered oreos. And congrats on the tempering for the rocky road! I think we sometimes just want/need to prove to ourselves that we can do something. Hope all is well! Thank you, Monica! Actually,I can’t wrap my head around all the technicalities of the blog either! I belong to several blogging groups (on Facebook) where people are very helpful. Then when I was ready to make the leap I hired a professional rather than risk losing my blog in cyberspace! Self-hosted means I have to learn how to make this space work….its a steep learning curve. 🙂 That said, if you ever notice that something isn’t working here, PLEASE let me know. I probably wont be able to fix it myself but I know where to get help. The blog move and the tempering are both as you described, something I have to prove to myself that I can do. As for the cookies, Soldier B. sent me a message this morning saying that the chocolate covered mint oreos were his favorite care package goodie yet! Oh Wendy – that was a wonderful message from your happy box recipient. We appreciate our soldiers so much! And we appreciate you sending your tasty goodies. What a wonderful gift. And… love, love, love your new look! Wonderful and clean and bright. Very nice indeed! Have a great week and blessings to you! Thanks, Tricia! You are so sweet! Being actively aware of the sacrifices our military make daily has been an unexpected learning opportunity for me from this blog. I am honored to be able to offer my cookie thanks to Soldier B. and his buddies! 🙂 Thanks, for your kind words about the new look as well. SO much to learn! I can only imagine the smiles of delight when your care-filled packages are received Wendy. I love the way you even decorate the inside of the box. You are quite amazing! those are killer! the swirl is making my eyes very happy haha. i cant believe how perfect they are! 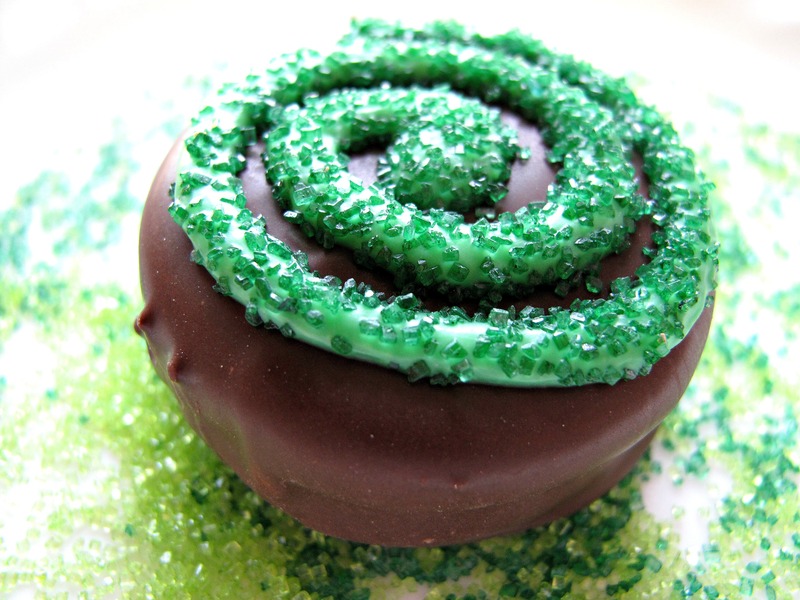 I love chocolate covered Oreos and these look perfect for St. Patty’s. Thanks for sharing at Throwback Thursday! Thanks, Carlee! These were a favorite of the soldiers I sent them to. Everyone loves Oreos! Now these made me smile – an over the top oreo! All sparkly! Thanks for sharing this with us on Throwback Thursday! Hope to see you next week! What a fun care package! Love the rocky road candy and the OREOS too! Thanks for linking up for Friday Favorites. I’m featuring you this week. Thank you so much, Jerri ! Themed care packages are a lot of fun to put together. 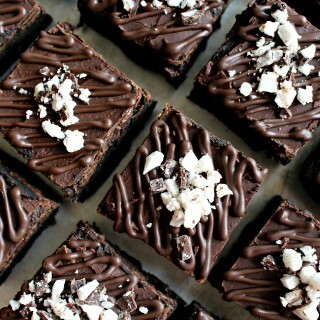 Along with the Oreos and Rocky Road, I hope I packed some smiles! Looking forward to Friday Favorites! Thanks for hosting AND thanks for the feature!! 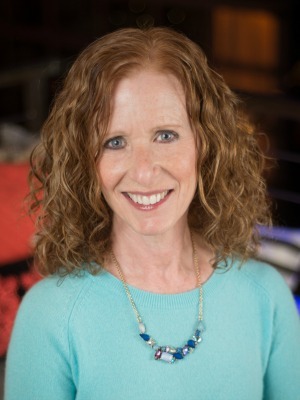 Thank you, SweetJ, for your kind words and for the feature! These Oreos are super simple to dress up and are a big hit with everyone who tries them. My hope always is that the troops will taste and feel the caring that goes into each package! That is such a wonderful care package! I bet my boys would love these decorated Oreo cookies. Pinned. Thanks, Joanne! Everyone loves chocolate covered sandwich cookies! I now like to use the Newman’s Own brand that comes in a variety of flavors and even has a gluten free version! I hope your boys enjoy these. Thank you for pinning! 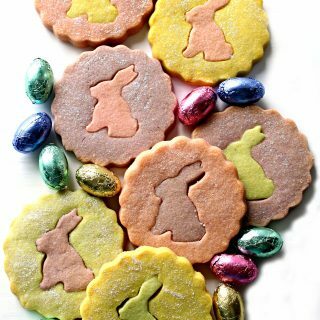 These look fun and delicious. Perfect for a school party too. Please share on my Sunday’s Best linkup. Our theme this week is Over the Rainbow. We’re looking for all things green & St. Patrick. Starts every Saturday at 8:00 pm. We’re live now, would love to feature you. Lucky soldiers to get so many caring goodies in this box from a very caring lady! Your post is awesome and thanks so much for sharing it with us at Full Plate Thursday. Have a great week and come back to see us real soon!